A 50-year-old man has been arrested on suspicion of murder almost a year after a 17-year-old girl was shot dead in north London. Tanesha Melbourne-Blake was killed as she walked with friends in Charlgrove Road, Tottenham, at about 21:35 GMT on 2 April 2018. Police believe she died when shots were fired from a vehicle as it drove past a group of young people. The man is the fourth person to be arrested over Tanesha's death. He was taken into custody at a north London police station, according to the Metropolitan Police. Two men, aged 18 and 22, were arrested earlier this month on suspicion of murder. The 18-year-old has since been released under investigation, while the 22-year-old was released on bail until mid-April. A 31-year-old man was arrested on suspicion of murder four days after the shooting and released while inquiries continue. 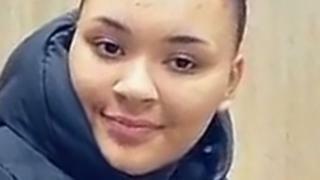 Tanesha was the ninth teenager to be killed in London in 2018 - a year which saw a total of 132 people die as a result of violent crime, the highest level for a decade. Her brother Hakeem Blake said Tanesha was shot because she was in the "wrong place at the wrong time".